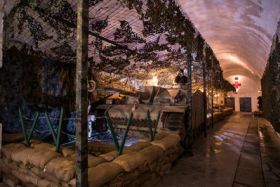 Award-winning attraction, Jersey War Tunnels will be re-opening its doors to the public on Friday 01 March following significant investment in a new 1940s café and second escape room. Over the winter months, Jersey War Tunnels has designed and created a new 1940s café in its visitor centre called Vega Café. The café is named after the SS Vega that brought Red Cross supplies to starving Islanders in the Channel Islands during WWII. Complete with floral wallpaper, authentic furniture, vintage china, gingham curtains and green carpet, the café provides visitors with a truly authentic 1940s experience. The café will be staffed primarily by Islanders of retirement age and will serve a selection of cakes as well as hot and cold meals. The ‘Library’ section of the café will be available for weekend afternoon tea bookings and private parties. CLICK HERE for Jersay War Tunnels.